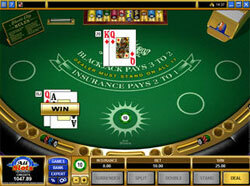 The blackjack or 21 has a number of rules which are to be understood by the players. It is the game of skill, so be ready to train hard. As far as the online blackjack is one of the best online casino games, it demands the total control over the situation and other gamblers. Before playing, choose the table carefully. In fact, it plays the essential role in further process of the game. The most important about the table is the signs which declare betting limits. Both the maximum and the minimum available bets are represented on the sign on the top of the table. It is possible to look around and find the most suitable table to play on. Usually the signs are color-coded to denote the minimum and maximum bets posted on them. As the rule red is used to indicate 5 dollars, green-25, and black-100 minimum. In order not to mix the blackjack table with the other casinos tables, it is important to find the phrase "Blackjack pays 3 to 2"(but not more!) printed on the table. It is also important to pay attention to the play the gamers are dealing with. For a newcomer it is preferable to begin with the "shoe" games. Here 6 or 8 decks are used. The advantage for the newcomer is the fact that all cards are dealt face to face with each player. Besides, a dealer may help in playing decisions and making issues. If you have already gained some experience, you may pass over to the fewer deck plays. Once you are at a table, you need chips for further game bets. In the break between the actions, it is possible to make a bet by putting the chips on the appropriate section of the table. In some occasions the players have to wait for the dealer's invitation to join the game. The best buy-in amount is from 10 to 20 times of your average bet. 5-10 dollars are the typical buy-in if you are a 5 dollar better,. It is wise not to hand in the cash to the dealer in security purposes. He is forbidden to take anything straight from the hands. The cash usually is put on the table; the dealer picks it up and changes for the appropriate amount of chips. The colors of the chips are fixed in the casino industry. Thus, red means 5 dollar chip, green-25, and black-100. 1 dollar chip is marked with white; 1 dollar tokens are silver on the table. If any questions emerged - ask the dealer. On the table there is the circle or box for the bets. The bet is made by placing the desired bet into the circle before the beginning of each hand. In the case of multiple bets, the larger denomination chips are put on the bottom of the stack, and the smaller on the top. If the cards are already dealt, no one allowed touching the bets. The dealer counts the chips if you want to know the amount for increasing the bet. When the hand is over, the dealer collects the bets or removes the wins. After the dealer repays, you may remove your chips from the circle or place the next bet. After finishing the game, the player may exchange the chips into cash. The player goes to the cashier. If there are the groups of smaller denomination chips, the dealer may color them up. It is suitable for exchange the group of the small denomination chips on the larger valued. After the end of the hand, the chips are pushed out in front of the player between the boxes. The player may take them and exchange or go to the other table to play.